I think I will tackle that in a future blog post! What more could an author ask for? I was pretty much hyperventilating the entire week. But it was yesterday’s browsing on Amazon which yielded one of the best thrills of the last seven days. On Amazon, there seems to be a ranking for just about everything, so maybe it shouldn’t be surprising that there’s a list titled: Most Popular Authors in Literary Fiction. 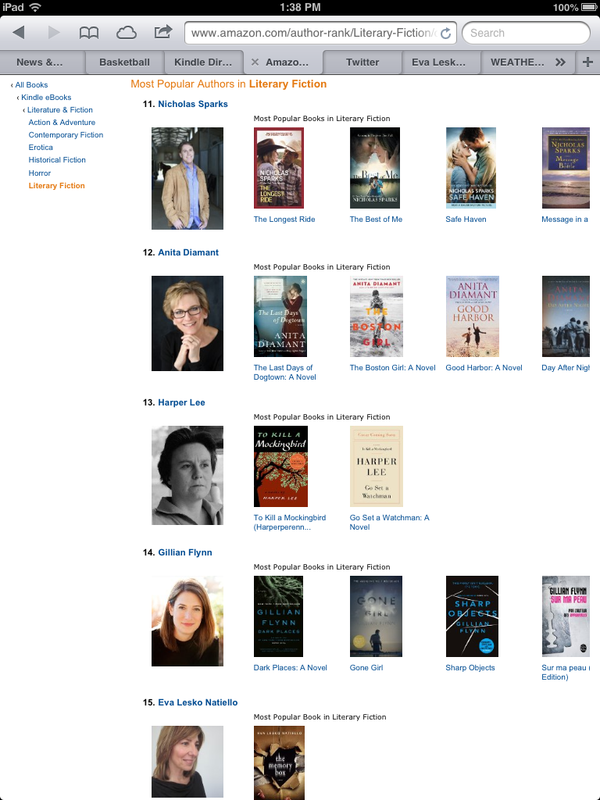 It was, however, not only surprising that I should find myself on that list, but extraordinary that I ranked #15 right under Harper Lee and Gillian Flynn! Thank goodness I had the presence of mind to screen shot it! It’s a wonderful WELL DESERVED affirmation of the rewards that a combination of hard work, diligence, and determination, bring. I am SO happy for you—and for all the readers who now know what a fantastic writer you are! Hi Scotti! thanks for stopping by and for reading The Memory Box. I’m so glad you liked it. Now I just have to find a million more “fun” seekers like you! Eva Natiello IS crazy- crazy talented and crazy smart. What a ride this book is on. Can’t wait to see what happens next. The reviewer might have meant a different “crazy” but thank you for your generous and kind interpretation! This is so exciting–that’s so wonderful, Eva! Now you have more new Readers and fans waiting for your next memorable book. . . . I hope you’re right, Judee!